Paqui, or ¨big house¨ in raramuri, it's a hostel well located near downtown and other touristic attractions of Chihuahua City like the train station. We have a nice dorm and first class private bedrooms with all the services you will need. 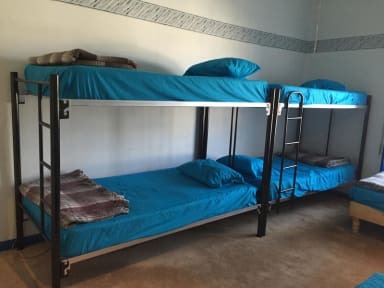 Our family hostel has 4 private bedrooms and one sunny and calm dorm of 6 beds that can accommodate until 8 people. Our deluxe bedrooms had first class private bathrooms, one with Jacuzzi. There is a great backyard and balcony with BBQ set and space for party, even better let us organize you our traditional BBQ and regional meet. We are well known for our breakfast and home made jams, our big kitchen its at your disposition and there is also TV place and a salon to hang around and relax! We also have place to arrange your private meetings and reunions. There is also in place WiFi Internet, laundry service, haircut and beauty studio, conveniences and souvenirs. I enjoyed my stay. This is a good place. I was sick during my stay so didn't spend much time out of my room. The staff were friendly and helpful. Thank you. One of the best hostel with the best people!! A lot of space, very clean, well located.... I stayed 6 days while planning to stay 1 haha and the best rabbit ever!! Great place. The house is nice and Manuel is very attentive. He's a good guy. The ladies who clean are respectful. The breakfast is varied every single day. I really loved this place. Manuel always makes you feel like you are at home. I really enjoyed my stay. The location is in a very nice quiet neighborhood and was close to the bus station for easy travel. The breakfast selection was the best I've experienced - plenty of food, great variety, and a nice table to eat at with good utensils. Manuel has a very beautiful home, and I will definitely be staying there again! Nice place staffed by friendly people. Wonderful breakfast! However, they can do more to keep tidy each of the rooms. More importantly, the facilities need several minor repairs. Not a big deal, but but details are important. Far more important, there is not hot –just warm– water in the bathroom most of the time, which is a problem in a city famous for how cold it is –in Mexican standards– in winter. Also, the heating in the main suite is not the best. There were almost no other travelers and in order to get to the city, you need an Uber. More a B&B then a hostel. While the place was comfortable, it wasn’t near the center or anything else you might want to do in Chihuahua. I also believe that somewhere that includes breakfast should have real coffee, or at least black tea. This was disappointing and meant I spent extra money on those things out even though I already paid for breakfast at the hostel. Fine, but it certainly does not deserve its 10.0 rating. As many others have commented this is more like a room in someone’s house than a hostel. Not much atmosphere and the staff weren’t really around that much. When they were they were really friendly and helpful. Room was clean and perfectly fine but a little overcrowded with furniture. It was fine for our one night stay. Location was OK, too far from downtown but we found a nice bar and place to eat nearby. Area felt safe at night. We stayed for one night before catching the El Chepe train. Positives: comfortable bed, quiet location, provided breakfast early for us to catch the train. Negatives: broken lockers and no lock on first room we stayed in so we asked to move. Reason we were worried about this was a very intimidating guest who was staying there at the same time. Unfortunately this ruined our stay at paqui hostel, through no fault of the owners who were welcoming and helpful.